Adult learning in Heeley this autumn | IT'S HAPPENING IN HEELEY! 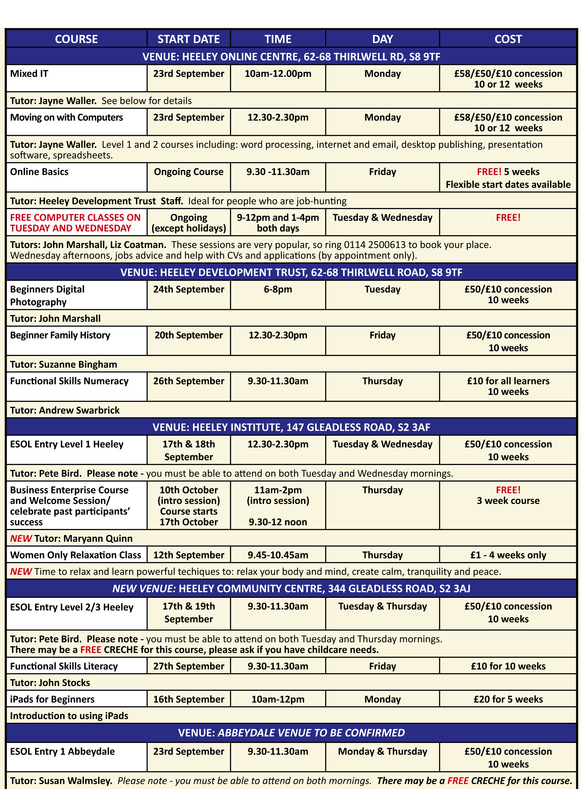 A wide variety of adult learning courses will be available to the Heeley community this autumn. English for speakers of another language, functional skills in literacy and numeracy as well as more advanced courses in word processing and desktop publishing will be available alongside the on-going open access sessions at the Heeley Online Centre on Thirlwell Road. “We had to open another day at the computer suite as it was so busy” said Sheffield Community Online Learning Manager Maxine Bowler. “Everybody has said that they’ve really enjoyed it, and that they’re learning something that is really useful for their lives”. Courses in Digital Photography, Business Enterprise, Family History and iPads for Beginners will be hosted by the Heeley Development Trust, the Heeley Institute and the Heeley Green Community Centre. “When the Heeley Advice Centre closed we didn’t want the community centre left empty, so we will be establishing a small computer suite there” continued Maxine. “Classes will be aimed at those who are harder to reach and at risk of loneliness and isolation through digital exclusion”. “By getting online you can communicate with friends and family, research hobbies and interests, go shopping, start a campaign or even manage your own website. One of the joys of adult learning is being taught by members of your own community, who are there because they want to teach”. The Heeley Development Trust will also be delivering free online basics sessions at libraries city-wide, in partnership with Sheffield City Council. “Everything is going online, banking, advice services, communication – Universal Job Match has made digital inclusion essential for job hunting, with universal benefits to come. Older people, social housing tenants, those with health or mobility issues and new arrivals to the country will be vulnerable to further exclusion”. The September term courses are below; contact Liz or Maxine at Heeley Dev Trust on 0114 2500613 or liz.b@heeleydevtrust.com & maxine.b@heeleydevtrust.com to book on or for more details.